Build, sell, and buy houses in this game. Is there a better alternative to Build-a-lot 2? Is Build-a-lot 2 really the best app in Simulation category? Will Build-a-lot 2 work good on macOS 10.13.4? Build-a-lot 2... 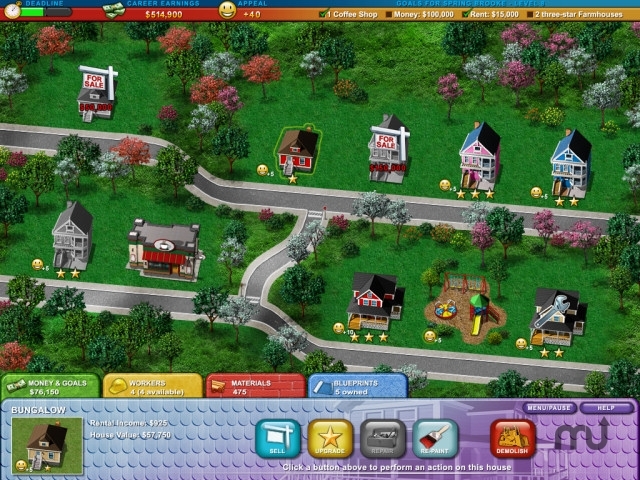 It's time to get busy again building, buying and selling houses in Build-a-lot 2: Town of the Year! There are new towns to explore, new Mayors to meet and lots of money to be made as you cast your vote for the 'Town of the Year'. Use your keen eye to pick the right locations to build parks and shops. Pick your paint colors, upgrades and landscaping to create the ultimate curb appeal and earn outstanding profits. How about a latte from the new coffee shop? Some new flower boxes from the garden center? It's all waiting for you in Build-a-lot 2 ...welcome to the neighborhood! Build-a-lot 2 needs a review. Be the first to review this app and get the discussion started! Build-a-lot 2 needs a rating. Be the first to rate this app and get the discussion started!